Packed with calcium and phytonutrients that lower your RealAge, each pizza makes your RealAge 8.7 days younger if eaten 12 times a year. Heat oven to 450 degrees. Cut white and light green part of leek into thin slices. Heat a large nonstick skillet over medium-high heat. Coat with cooking spray; add leeks. Stir-fry 3 to 4 minutes or until edges begin to brown. Arrange pizza crusts on a large baking sheet; top with pizza sauce, leeks and tomatoes. Crush fennel seeds slightly between your fingers and sprinkle over pizzas. Top with 1/2 cup of the cheese. Bake 8 to 10 minutes or until crust is golden brown and cheese begins to melt. 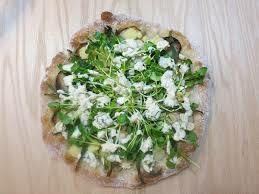 In a medium bowl, toss watercress with vinegar; sprinkle over pizzas. Broil 3 to 4 inches from heat source for 1 to 2 minutes or until wilted. Remove from the oven and sprinkle with remaining 1/4 cup cheese. Fruit vinegar cuts the richness of the cheese and adds another element of sweetness. Adding layers of flavor is a way to make this pizza especially good. Make sure you sauté the leeks until the edges brown—this is the beginning of caramelization, which shows the leeks’ natural sweetness. 1 (12 inch) pizza crust, such as Boboli Thin Crust brand may replace the four individual crusts, and cider or sherry vinegar may replace the raspberry vinegar.